We all know that quirky, tartan-clad Cape Breton identity that our tourism and music industry likes to tout so much. They sell it so hard people in Ontario probably think we step dance to work and play fiddle tunes during our coffee breaks. That we eat our weight in lobster every summer, and we don't need alarm clocks because our town pipers are so **** punctual. 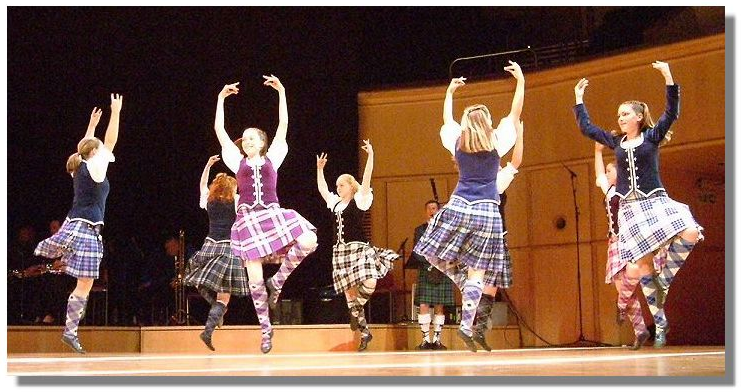 Here we see the customary Highland Fling to conclude all successful business meetings. And you know what? That's fine. All that stuff can be a lot of fun at a Ceilidh in Judique, even though I have no idea how to dance without moving my upper body (my hips are just too **** wiggly). But I feel like there are a lot of other things, things that are distinctly and uniquely Cape Breton that are easy to take for granted, and get quickly overshadowed by our more marketable traditions international tourists pay through the nose for. These traditions might be so rooted in Cape Breton, you might not even realize how different they make us. Luckily I've bounced back and forth to enough places to understand how weird Cape Breton actually is, and here are my three things we aren't proud of, but probably should be. Picture courtesy of someone's Mom. You should call her more. Let's get this out of the way right now. Cape Breton, your cooking is not good. It comes from the long standing English and Scottish culinary traditions of being bad. I don't know what Cape Breton committee came together a hundred years ago and decided all of our vegetables should be soggy and our meat should taste like hockey pucks, but it was the most successful conference in Nova Scotia history. 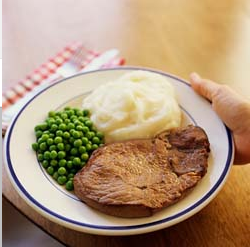 Ah, the old meat, potatoes, and vegetables trifecta. Looks like a pie chart and tastes just as interesting. And who can blame us? No pepper or spice with any flavor grows within 1000 kilometres of this place. That's why all our food tastes like the colour gray, and my Grandmother can't handle pepperoni. We live on tasteless root vegetables, and we'll die on tasteless root vegetables. It's OK though. I'll take it, because when that bread basket hits the table, all is forgiven. The mushy peas, the chewy steaks, the dry chicken. 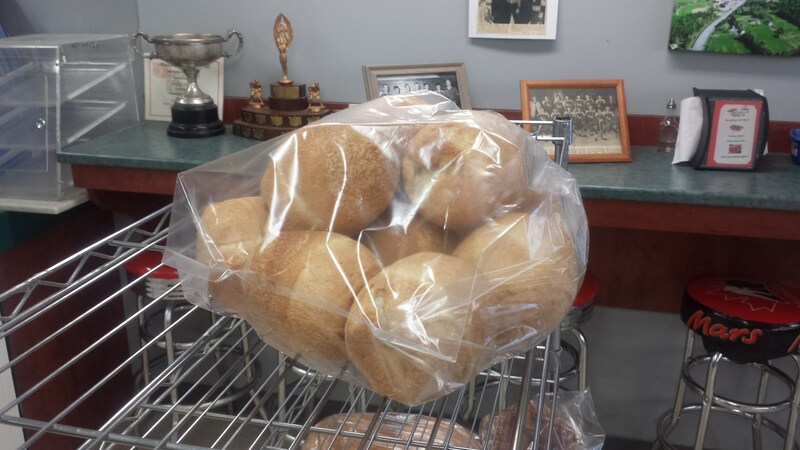 It's all suddenly fine, because you might not know this, because you're used to the best bread in the universe, but Cape Breton bakes the best bread in the universe. Mullin's Rite Stop buns. Also known as "Why everything's going to be OK."
Those are buns baked at the Mullin's gas station. Gas station buns have no right to be as good as those gas station buns. You know what happens in any other part of the world when you walk into a gas station and ask for buns? They look at you funny and might call the cops. At Mullin's, you get the best buns of your life. Also, in China they eat steamed buns. Ever think to yourself "This bread would be much better if it were slightly damp!" Yeah, I didn't think so. Also pies, cakes, brownies, pork pies, cookies, and diabetes. #2 Playing the most complicated card game known to man. 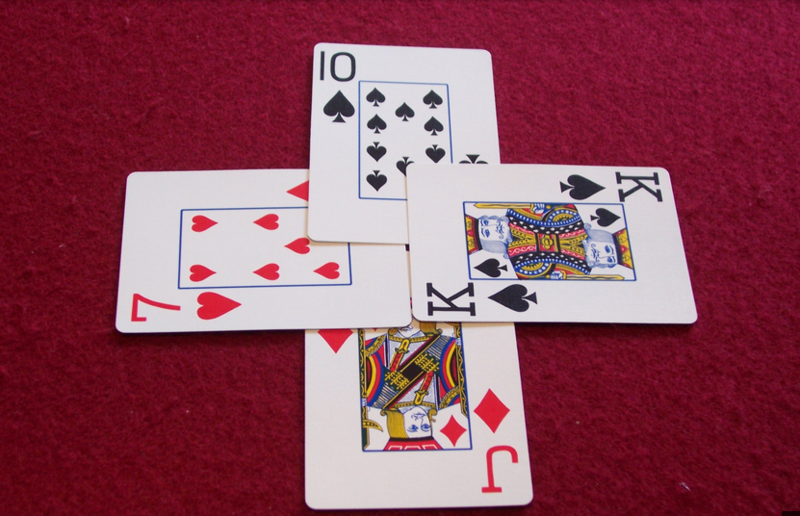 If Spades was Geometry, and Hearts was Algebra, Tarabish would be trans-dimensional quantum mechanics. At least those other games have the decency of naming their trump suit. In Tarabish you have to go through a complicated song and dance to even decide which suit trumps what. Then you have to wrap your head around the scoring method. This is either the point values of Tarabish, or the secret codex to get into Sydney's underground wizard guild. Like, really, who wants to add 14 to anything? And I've seen people add up these values faster than Rain Man. It's eerie. Also, the Jack and 9 are top cards? What? A-come-from-away sitting down at a Tarabish table is like Alice sitting down with the Mad-Hatter and the March Hare, realizing everyone's gone insane and the world just flipped upside down. Warning: While teaching someone how to play Tarabish, they WILL eventually accuse you of making up the rules as you go. It's the Calvinball of card games. 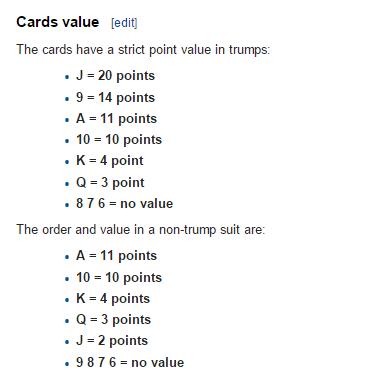 I'm not sure if this is a card game or a Navajo code language invented to confuse Nazis. No other place in the world plays Tarabish. Seriously, it's the third sentence in the wikipedia article. "It is played primarily by the people of Cape Breton, Nova Scotia, in Canada, where it was brought in 1901 by a Lebanese immigrant George Shebib." They don't even play it in Lebanon anymore, and that's where the game came from. That's the kind of quirky nonsense that makes this place special. I'm not even talking about the pretty, coastal ones. I feel a great disturbance in the force, as if millions of people suddenly hit the "Back" button. Yes, I know complaining about the roads around here is the unofficial provincial pastime, and buying new exhaust systems because of the crater-ridden moonscape that is Terrace Street is expensive, but let me ask you something. Ever drive the 5 mind-numbing hours it takes to get across Manitoba? The roads are great, and you can see them all if you can remain conscious. A corpse could navigate the Manitoba provincial highway system. There are many flat places in this world with painfully boring roads, but Cape Breton is not one of them. This island is wet and hard, and trying to find a decent place for 8 feet wide asphalt probably caused more than one civil engineer to have a stroke. Our land is tough and our roads are curvy. Photo courtesy of, well, you can probably guess. That's Trout Brook Road. It's how I get to work everyday, and completely bonkers. The speed limit is 80kph, and I don't know who set that, but my guess is a toss up between Evil Knievel and Super Dave Osborne. 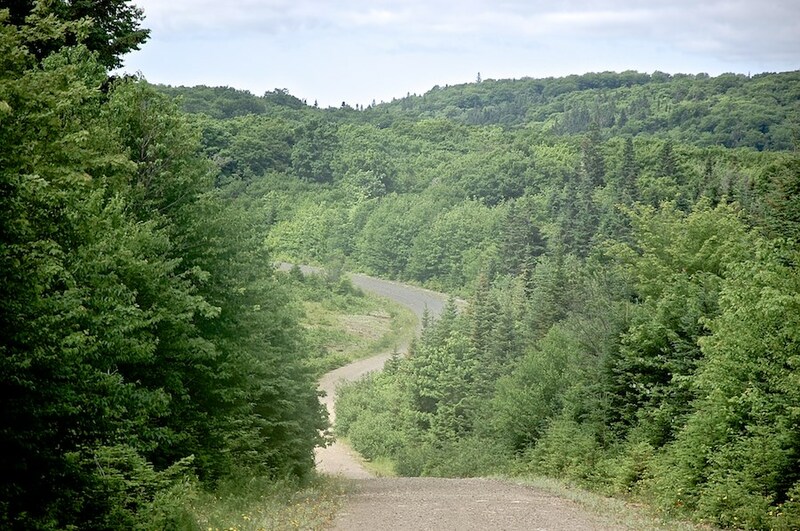 Drink three coffees, drive the speed limit, and get ready for a white knuckle ride, because that's when Trout Brook Road becomes your own personal Monte Carlo. This winter I was driving into Sydney, going the speed limit which I've already mentioned is terribly unsafe . My tires dug into some ice and I pulled a 180 into a snowbank (also due to the chronic condition known as "being a bad driver"). I was fine. Really. Because spinning out on Trout Brook Road isn't that different from actually driving on it. Besides some creative body work I had to do to my bumper with garden shears, I continued on as normal. It almost killed me, but man, I love that road. Why don't we have officially sanctioned road races here, with motorcycles? Imagine cheering on crotch-rockets speeding around the Cabot Trail from the Skyline. That would be rad! Or helicopter shots of race cars tearing around Smokey Mountain? That sounds like something that should exist. We could eat squares at the tarabish tournament while watching the race at the legion. Now that's something I would sign up for. Let's see, did I miss anything? We have great bridges to jump off. We're strangely generous with our rum. We curse like poets. What do you think? What should we be more proud of? More than once I've thought Cape Breton would be a great place for its own Targa rally (See the one in Newfoundland here: http://www.targanewfoundland.com/ ) One of my favorite things to do in Cape Breton is just drive. Drive on the old highways. I have seriously seen myself go out for a drive, come back 6 hours later and never leave the island. I do remember there being some activity about an international motorcycle race in the Highlands about 10 years ago and thinking CRAZY. Wonder what happened to that. Came to their senses maybe. It's huge international business. The Isle of Man TT folks wanted to do a race here, including road upgrades. It was killed by the Province because "someone might die". People die every year at the events; it is racing on the absolute edge. It is a shame however; an event of that caliber would book every hotel room in CB for a month - which is what happened on the rumor of a TT. So the cliffs and everything are a feature not a bug to these race people? Same here Matthew; did that yesterday with all the back roads in Rear Baddeck..just beautiful ! Lots of old back roads to explore in C.B. Not fond of our cuisine? ~ Dibs on Rory's lobster !!! An update on Tarbish playing. While in university, I did a work-term placement at a steel plant in The Netherlands, in the research lab. The guys in this lab played Tarbish! Turns out, the previous co-op student was also from Cape Breton and he taught them all to play. So have to include the steelmakers at Hoogovens in the list! Ok. My comment on Tarabish. It is the same as a card game played by traditional Jewish communities called Klobiosh, Klaberjass, Klobber, etc. All the same rules - same order of trump, same card values, same bidding, Bella, 20s, 50s, 10 for last, dealing in 3s, bidding - you name it. Identical. So it must have originated in the Middle East at some point and migrated between cultures before ending up here. However, we have not only adopted the game, but made it a way of life. Sorry to burst your bubble, Rory ! I've done a little traveling and have to say, putting down on the bounty of the root-cellar is pure sacrilege when compared to the bland meals served south of the border. Salt is a historical mainstay, salt fish, salt meat and hardwood smokers churning out a variety of delights. Smoked Mackerel bathed in maple syrup. Preserves, preserves and more preserves. Chow, beans and beets. Some of the best chowders in the world. True to my Irish decent, "there is room for all God's creatures; next to the mashed potatoes!" Love your last statement. Too funny. I think the tarbish thing has possibilities. Twin Glace Bay with Beirut, start an Internet based tarbish tournament, and pretty soon you'll have every gamer in the world knowing where Cape Breton is. I've had some great tea biscuits in CB, and some white hockey pucks. 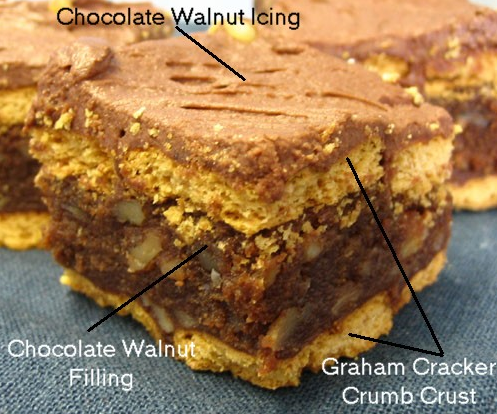 The trick is separating the family recipe baked goods from the Pinterest candybar mashup of the week. Play to the island's simple roots: biscuits, oat cakes, molasses bannok, to name a few. Pair with a good tea and you have 2 of the 3 ingredients of a Cape Breton dessert (the 3rd is a nap). Good one! Invented by a local pharmacist who had a store on Charlotte Street, I believe. But possibly taken to Montreal and patented by one of his employees? Or is that an urban legend? I'd like to hear more about that story. Been to Paris. The baguettes were nice. Been to London. The biscuits were pretty good. Had ciabatta in Venice. Interesting. Then I went to Albert Bridge and fell in love with complex carbohydrates. Those other breads might have lineage and culture, but I'll take a dinner roll from the Neil's Harbour Chowder House over that European nonsense any day of the week. Maybe I'm just not meant to be classy. Also, check out MacNiel's Bakery next to Dr. Luke's. They're doing some real interesting things with dough these days. Next time I'm in Neil's Harbour I'll try the rolls :) I admire you loyalty and pride in Cape Breton baked goods even if I don't think I'll ever be a convinced! All I can say is that when I return to CB for a visit I have a list of things I must eat. At the very top is chocolate cake with boiled icing, but close seconds are dinner rolls and porridge bread. Best anywhere (if you can even find porridge bread elsewhere). Joanie has a very good recipe for that cake if you want. Oh I have recipes for all these things, but I'd rather someone make them for me. Is it too much to ask that I can both fill up my gas tank AND get top notch cake from the same place? In Ontario, sadly, yes. Erin, visit Cheticamp and stop in at the Frog Pond Café on the north side of the village. Part of the Sunset Gallery experience, this little Café serves Myron Syms' homemade sourdough breads, danishes, chocolate almond croissants and much more. Also try the Dancing Goat in NE Margaree . Economies prosper on product . Promoting CB is no different . If you have the product ,they'll come and stay and shop. WE think tourism is all about the "destination" . The "theory " is that If we convince them to come to CB this year, then more will come next year , and more the next year .This hasn't worked in the last 10 years and no one is asking why or where the destination room tax money is going . We need to send people home all excited about their trip here. All positive , no negatives . Regardless that government makes a huge return off tourism , we no longer have a tourism department in NS . We no longer inspect accommodations . We have fewer tourist bureaus than 10 years ago . Product? Think of Newfoundland and how they have developed product and their image . Targa is a huge product . Punt races too . NFLD didn't go with music, they went with colourful houses . They didn't go with a Cabot Trail, they went with their little harbours and their colourful boats . Hikes? Their hikes are every where . Tourist bureaus are everywhere . What food experiences do we offer on CB ? .On CB From one place to the next , you have no idea what you will get in a bowl of chowder . Little things matter . We want $5 for a piece of pie?? Walk Charlotte street and ask " Is this a nice clean street and sidewalk "? Have you noticed all the weeds along the highways that are hiding all those lovely flower beds at our intersections and rest stops ? Think the old MG car race was in the Highlands Park , so the feds stopped that . BTW, look at how many tourism things and tourism infrastructure on CB is/are "federal" as opposed to "provincial" or "municipal" even though the Municipal and the province make the most money from tourism, so why do they put in the least ??? Marian : I tell people to drive into a community, even one like a Sydney , and pretend you are a tourist and do not know where to go, for starters . Did you see a neat and tidy route , entrance to the town or village ?? Did you find the tourist bureau easily ? Were the other drivers courteous ? Did people on the street ,in the stores , smile and act friendly ?? Was the restaurant clean and servers friendly ?? Did anyone ask if you needed any help or directions ?? We are losing our basic attraction which is great views along the Cabot trail and Baddeck too. The trees have grown up and covered most views i have written to the Ministry of Tourism. i swear nobody there ever looks. they actually still send tourists by the fleur d'lis trail which is basically a spruce maze. this is a major problem and the dept of tourism better send somebody out to look at it. this is going to take big time government input and cooperation across the island to fix and it is URGENT. tourists are going home telling people not to come to the cabot trail because you cant see anything. and the Fleur d'lis trail has been a horror story to most tourists. This is a good point, Gary. Even the official "look-offs" have obscured views now, so you have to peek between the trees to find the view. Another thing is the billboards cluttering up the roadsides and scenery. PEI has a sign law that bans this practice, and it's high time we did the same. I.e. you can only put up a sign on the property where you actually do business. Some are professional. Some are hand-painted with a 6 inch brush and slapped together. Does anyone actually think that billboards work anymore? Tourists research their options online. Bill boards destroy the scenery, which diminishes the visitor experience, and this of course is bad for tourism overall. You need to advertise? Spend money on mobile (which everyone has with them at all times) and ditch the visual pollution. Richard and Gary . If you look back over the last 10 years , you will see some major shifts took place in tourism quite quietly and under the radar . WE no longer have a provincial tourism department . All we have is a provincial marketing agency that was created and 4 years later was made a crown corporation . 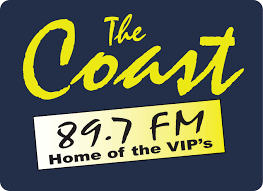 On Cape Breton , the old Tourism CB became Destination CB and then also about 5 years stopped being a membership organization and is now basically a private common , 99% subsidized by taxes from ACOA and every municipality . There is no tourism investment budget for infrastructure anywhere ,let alone to create more or maintain look offs . NS is selling the Digby Pines and Liscomb Lodge and were so smart they didn't list any selling price. NS has done nothing to curtail the underground in 10 years . There are hundreds of underground rentals on CB alone . Then Air B&B , VRBO and Canada Stays scooping millions in commissions while the province and municipalities help people avoid property taxes . It is or was our unique Inns, B&B's,and cottages that were such beautiful images of product that have now become poor ,even money loosing investments, yet the province likes to take credit for increased tourism when we know it's the low dollar that saved them . It is the owners of the properties that should get the tax breaks not the marketing groups . You need a promoter or an organized group to get such large events off the ground . NOT sure what group exists to day that has that kind of interest and ability other than the guys who like to do concerts . Nova Scotia no longer has a tourism department . Cape Breton no longer has a tourism association per se. The Municipalities on CB do not seem to collaborate on anything that is an Island wide application ,let alone pool dollars . There used to be some kind of auto relay that the MG auto clubs people held but think the Parks stopped giving permission . 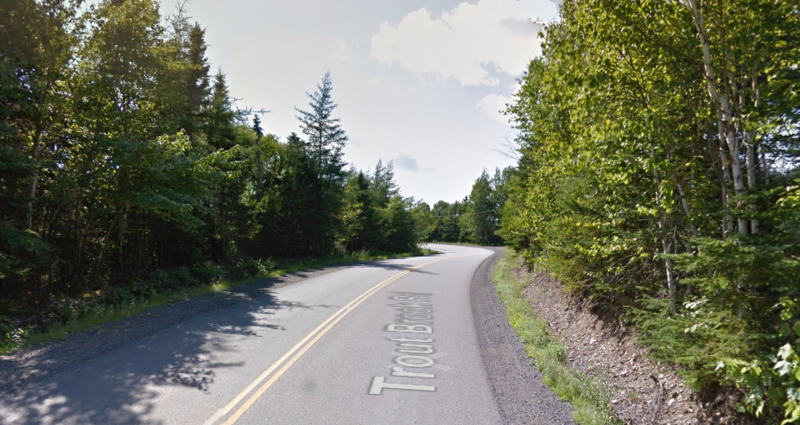 LoL Trout Brook is my road also and I Love driving it! ...but I'm not telling you what I drive just in case you get upset over being passed some day! Great post, all of it! Love driving in C.B., also love this site. loved this , had great laugh, traveled many of these roads from Port Morien, thru the back woods, many not paved, returned after years away and said the same thing about the food, while I was enjoying every mouthfull, and driving miles to get the weeks supply of bread from Mullins. thanks so much, just found it, and looking forward to many more, blessings from here in Alberta.